The recipe title says it all - these Too-Good-to-be-True Brownies are fudgy, chocolaty and delicious (they're also a HEALTHY LIVING recipe!). See, we told you these brownies were good! Mix flour, cocoa powder and baking powder; set aside. Microwave chocolate and butter in large microwaveable bowl on MEDIUM 1 min. or until butter is melted; stir until chocolate is completely melted and mixture is well blended. Add remaining ingredients; mix well. Stir in flour mixture until well blended. Pour into 8-inch square pan sprayed with cooking spray. Bake 20 to 25 min. or until toothpick inserted in centre comes out with fudgy crumbs. (Do not overbake.) Cool brownies in pan 10 min. Remove from pan to wire rack. Cool completely. To prevent brownies from overbaking, remove them from oven when centre is still slightly soft and brownie begins to pull away from sides of pan. The brownies will firm up as they cool. Line empty pan with foil, with ends of foil extending over sides. Use to bake brownies as directed. Cool brownies 10 min. in pan, then use foil handles to remove brownie from pan to wire rack. Cool completely. 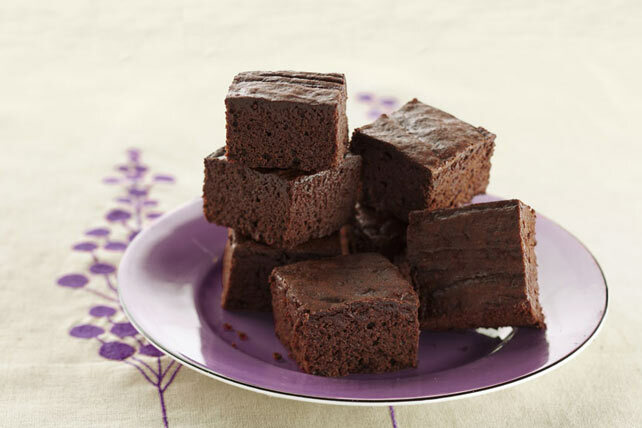 Not only do these brownies taste great, but they can also fit into a healthful eating plan for you and your family.